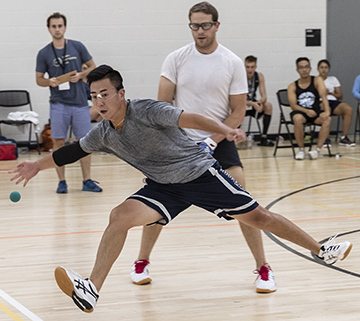 MINNEAPOLIS, Minn. — The second full day of action set the table for many of first one-wall and wall ball finals for the 2018 World Handball Championships. Ireland’s James Doyle, the top seed in the Masters Wallball and One-Wall Small Ball Singles survived two semifinals tiebreakers to reach the final in both divisions. In the Wallball semifinal, Jack Safros of New York came back big and dominated Doyle in the second game for force a third set, but Doyle recovered nicely to win easily, 21-12, 6-21, 11-3. It didn’t look like Doyle had much left in the small ball seminal against fellow countryman, John O’Connor. The lefty from Munster had Doyle on the ropes in the tiebreaker with a commanding 9-6 advantage. The deficit and pressure didn’t effect Doyle who calmly regained the serve and proceeded to attack the right side of the court, forcing O’Connor to chase returns with his off-hand. Doyle scored four unanswered points to reach match point and delivered a driving ace serve to the right to secure a spot in Saturday’s final. Doyle faces Minnesota’s Mike Gustafson in tomorrow’s Small Ball final. He’ll first go up against Ecuador’s Carlos Lalama in the Wallball final at 2:00 p.m. (Central).